Paolo was a 15th century painter and illuminator, born Giovanni di Paolo di Grazia, who gained prominence as an artist in the Sienese School of painting. He was sometimes known to use the name Giovanni del Poggio, so given from his native home in Poggio near Siena. He works have noted influences from other Gothic styled painters such as Gentile da Fabriano (1370 – 1427). It is said that he studied under Taddeo di Bartolo (1362 – 1422), but Fabriano’s influence was greater on him. This is most evident in Paolo’s earlier work such as his, Madonna of Humility. Much of his work was religious and as his style progressed he took on an even more expressive approach, described as lyrically exalted in his conveyance of pathos. This style of painting was not of the highest regard in his time, but his expressionist approach caught the attention of the modern painters and critics in the early 20th century. His pieces, such as his almost abstract Saint John the Baptist Goes into the Wilderness, are good example of a style that appealed to more modern, expressionistic painters. This is also seen in, The Creation and the Expulsion from the Paradise, which while still imploring a traditional Medieval style, Paolo painted figures contoured in form and tormented in feeling. A much more graceful approach can be seen in his Saint Catherine of Siena, while still depicting an elongated figure. 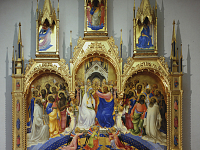 These more expressive ventures where a stylistic departure from Paolo’s early work, influenced by Bartolo, such as his Madonna and Child with Saints, which is now in the Uffizi Gallery. 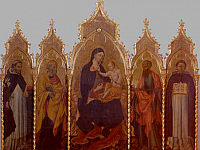 This early piece shows a Paolo who was emblematic of the International Gothic style, giving him some prominence in the Sienese School at the time. His most acclaimed works of the time were his altarpiece, Presentation of Christ in the Temple, and The life of Saint John the Baptist. With work that could at times be lightly surreal and dreamy, such as Saint Nicholas of Tolentino Saving a Ship, Paolo was prolific in his depictions, bordering on bizarre, such as his Last Judgment, Heaven and Hell, or his Assumption of the Virgin. His works are in several museums around the world, including Paris, Florence, New York, Boston, London, Amsterdam, Vienna, Madrid and Münster, among other cities. It is said that he may have illuminated some of the poet Dante’s (1265 – 1321) manuscripts.